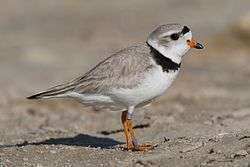 Gruimorphae is a clade of birds that contains the orders Charadriiformes (plovers, gulls, and allies) and Gruiformes (cranes and rails) identified in 2014 by genome analysis. This grouping has had historical support, as various charadriiform families such as the families Pedionomidae and Turnicidae were classified as gruiforms. The relationship between these birds is due similar anatomical and behavioral characteristics. A morphological study went further to suggest that the gruiforms might be paraphyletic in respect to the shorebirds, with the rails being closely related to the buttonquails. ↑ LIVEZEY, BRADLEY C.; ZUSI, RICHARD L. (2007). "Higher-order phylogeny of modern birds (Theropoda, Aves: Neornithes) based on comparative anatomy. II. Analysis and discussion". Zoological Journal of the Linnean Society. 149 (1): 1–95. doi:10.1111/j.1096-3642.2006.00293.x. PMC 2517308 . PMID 18784798.